In the part of the country I live in, I am quite sorry to say that I actually find a lot of the beer slightly boring. The South of England seems to me to be overly fond of light session bitters which to me don’t taste like much. Feel free to argue against this as I would love to discover some more satisfying local ales. I’m actually a bit of a hippy when it comes to groceries, preferring to shop at farmers markets and buying food from sources as local as I can find so I would love to buy more local beer too. I was very pleasantly surprised, however, to discover at my local Bitter Virtue that there’s a new kid in town (actually just down the road from where I live)! In July last year, the Vibrant Forest microbrewery was opened for business in Totton, Hampshire. I was initially attracted to the crazy names (such as Ginga Ninga and Flying Saucer), colorful labels and bright yellow bottlecaps. 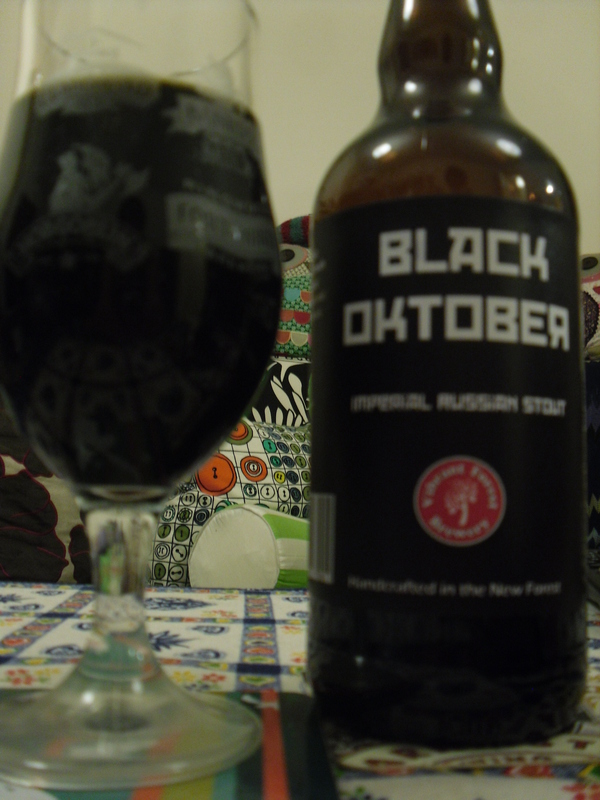 In the range, there’s a good variety of styles but I decided to choose a porter (I’ll review that another time) and the Black Oktober Imperial Russian Stout (7.2%ABV). The hunt is over. I found my local Stout! Well, I think finally we have an awesome brewery on our doorstep. I was impressed from the moment I opened the bottle. Since it’s from a small brewery and bottle-conditioned with live yeast, I was cautious open it. As you would see from my kitchen ceiling, there have been a few surprises from bottle-conditioned ales over the years. However it looks like Vibrant Forest know their stuff as it was opened with no drama and poured a beautiful luxurious deep black which is just how I like my stout to look. Although the bottle claims there should be a ‘coffee froth style head,’ I didn’t see one but that didn’t bother me too much. The aroma is so rich and complex with liquorice, vanilla, dark chocolate and malt. The taste is initially bitter dark chocolate but there is a bit of sweetness and some cereal maltiness at the end. The mouthfeel is thick, almost chewy and after each sip there’s a lovely warm feeling from the alcohol going right down to my stomach – perfect after a cold windy day like today. Such a satisfying stout! Vibrant Forest – you are my new favorite local brewery. It sounds intriguing, a lot of their output is quite a surprise, what would you eat with that do you reckon, is it a ‘pudding beer’? oops ignore above post it was meant to go under the bearded Lady one sorry! That’s ok. Yeah I’d be happy with this in place of coffee after a nice dinner.